About: RCCH Healthcare Partners spans 12 states, with its headquarters located in Brentwood, Tennessee. The organization is comprised of 18 regional health systems, and over 14,000 employees. Thirteen of RCCH’s hospitals use MEDITECH’s EHR. Challenge: RCCH sought to eliminate inconsistencies in their approach to preventing catheter-associated urinary tract infections (CAUTI), and to implement uniform best practices for indwelling catheters across the five hospitals on MEDITECH’s most recent release. To do so, they needed an EHR solution that enabled clinicians to more effectively analyze the data they needed to monitor and manage patients who were at a higher risk of CAUTI. 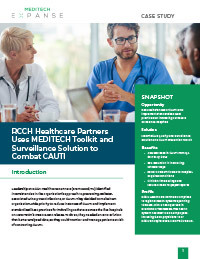 Execution: RCCH turned to MEDITECH’s Quality and Surveillance solution and CAUTI Prevention Toolkit to support them in the early detection and prevention of CAUTI. Quality and Surveillance alerted clinicians and care teams to their next appropriate actions, and helped ensure that all indwelling catheters were placed in compliance with CDC best practices embedded within the Toolkit. 35% reduction in indwelling catheter days.